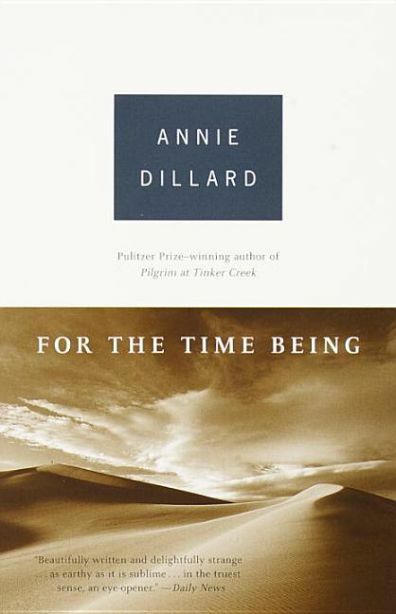 From Annie Dillard, the Pulitzer Prize-winning author of Pilgrim at Tinker Creek and one of the most compelling writers of our time, comes For the Time Being, her most profound narrative to date. With her keen eye, penchant for paradox, and yearning for truth, Dillard renews our ability to discover wonder in life's smallest--and often darkest--corners. Why do we exist? Where did we come from? How can one person matter? Dillard searches for answers in a powerful array of images: pictures of bird-headed dwarfs in the standard reference of human birth defects; ten thousand terra-cotta figures fashioned for a Chinese emperor in place of the human court that might have followed him into death; the paleontologist and theologian Teilhard de Chardin crossing the Gobi Desert; the dizzying variety of clouds. Vivid, eloquent, haunting, For the Time Being evokes no less than the terrifying grandeur of all that remains tantalizingly and troublingly beyond our understanding. "At heart Annie Dillard's work is a record of her search for God . . . [and] For the Time Being is a brilliant book that . . . sums up God more succinctly than she ever has before." "This uncommon book is a testament to a rare and redeeming curiosity . . . an exhilarating, graceful roundelay of profound questions and suppositions about the human adventure in nature. And as always, reading Dillard makes this mind-expanding experience an emotional one . . . with a voice blending clear-eyed factuality with prismatic meditations on ineffable things." "Writing as if on the edge of a precipice, staring over into the abyss, Dillard offers a risk-taking, inspiring meditation on life, death, birth, God, evil, eternity, the nuclear age and the human predicament. Her razor-sharp lyricism hones this mind-expanding existential scrapbook, which is imbued with the same spiritual yearning, moral urgency and reverence for nature that has informed nearly all of her nonfiction since the 1972 Pulitzer Prize-winning Pilgrim at Tinker Creek." "This absorbing meditation . . . [is] a spare yet exquisitely wrought narrative . . . By turns funny, flinty, and sublime, Dillard meshes the historical, the scientific, the theological, and the personal in a valiant effort to net life's paradoxes and wonders." "A work of piercing loveliness and sadness . . . One of those very rare works that will bear rereading and rereading again, each time revealing something new of itself."